Jambonex.com Review 2019: Is Jambonex.com a Good Hosting? Jambonex.com is a web hosting company based in Kenya. Established in August 2006, the vendor has over the years expanded its reach across East Africa offering shared web hosting, reseller hosting, and VPS solutions to individuals and businesses in the region. Jambonex.com markets itself as one of Kenya’s leading hosting companies offering cheap hosting solutions to its customers in Kenya and several other East African countries. Established in 2006, the company has created a reputation as a provider of reliable hosting solutions to companies, radio stations, churches, NGOs, and high schools, among others. Jambonex.com houses its servers in highly secured data centers located in the U.S. and Germany. Speed and reliability is made possible by its Tier 1 carrier environment in addition to its redundant data center facilities. The vendor has deployed high performance RAID-10 Failover Linux servers for high performance ensuring that its customers presence on the web remains undisturbed. Jambonex.com shared web hosting solutions come in four packages. J-STD is the starter package and includes 3GB HDD space and 30GB monthly traffic while its premium package, J-GOLD, comes with 10GB disk space and 100GB monthly traffic. All of these shared web hosting plans come with unlimited databases, unlimited email addresses, daily backups, daily scans, Softaculous one-click auto installer, and cPanel control panel. For fast growing enterprises, this vendor’s VPS solution might be the perfect fit. The solution is built for speed, security, and scalability and includes free migrations from your previous hosting vendor. Jambonex.com also offers advanced website security through SSL certificates from leading brands, including Comodo, Geotrust, Verisign, and Thawte. The certificates come with 40-bit to 256-bit encryption and are mobile supported. Jambonex.com’s hosting plans are reasonably priced. All prices are listed in Kenyan shillings. This vendor’s payment plans are somewhat inflexible, requiring customers to commit to a minimum of one year of hosting. All the same, the vendor has a 30-day money-back guarantee for new customers who might, for whatever reason, be unsatisfied with this vendor’s offerings. Jambonex.com commits to giving these customers a 100% full refund, and has an uptime guarantee of 99.9%. Existing and potential customers can reach out to the Jambonex.com technical support team via mobile phone, live chat, and ticketing system. The vendor has not made available a support email address. All the same, the support team is available 24/7. I opened a ticket and make some inquiries regarding the vendor’s WordPress hosting solutions. In just under 12 hours, I received a response detailing the options available to me. The Jambonex.com website has a fairly detailed knowledge base, as well. Jambonex.com’s commitment to offering excellent hosting solutions is clearly visible in its decision to invest in modern facilities that all but guarantee high quality offerings. And, instead of cramming many user accounts in suffocated servers, the vendor offers stable, feature-rich, and premium servers for use at reasonable prices. 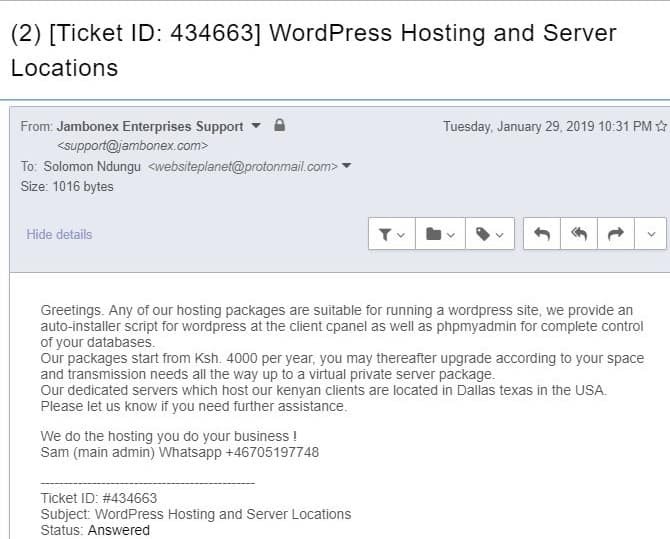 This is perhaps part partly why the hosting vendor has grown beyond Kenya to offers hosting solutions to businesses in various countries in East Africa. Migrate your website for free at Jambonex.com! Wondering how Jambonex.com stacks up against other Web Hosting companies? Enter any other Web Hosting company and we will give you a side-by-side comparison.